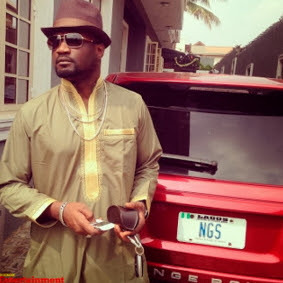 The elder brother of Psquare’s stars Peter and Paul Okoye has left their Squareville mansion in Omole for a new house recently completed by his younger brothers. Jude shared a photo of himself in the the new mansion on Saturday with the caption “Thankful,” which fueled the rumours that he has moved out of the Square Ville. On Friday morning, residents of Omole Estate woke up to the invasion of the Square Ville, home of Psquare, by policemen, purportedly carrying out a court order to reclaim about N8million said to have been paid to the artistes for a show they eventually turned down. Prior to the incident, Peter had started a Twitter rant, calling it quits with their elder brother and manager, Jude. The matter appeared to subside after Paul took sides with Jude. According to insiders, Jude is likely to ruin his brothers career due to his hatred for Peter Okoye’s wife, Lola Omotayo. I wonder why this their elder brother is behaving like a wayward,your brothers make you who you are today instead thanking God, your busy talking trash,if u’re angry because Peter married Lola plz go & hug transformer you will be ok if not B.P will catch you, hisss a brother who can’t help matters rather than to destroy.???? Jude, please stop the hate, it won’t pay you any good. Or was she your ex or the lady you tried to woo but she bluntly refused you. Is it the reason for the hatred? Na family mater be dis. People should not pucknos into their family affairs. Let dem setle there diferences by dem self, dat is if they had any. but can’t Jude stay in his own house and let the younger brothers be. Foolish people , na una sabi. May be Jude should go and get a life? And pls , what’s all this rubbish about him hating his sister in law. .? He should leave the couple alone. Is his brother complaining.? Aproko. They should just leave this lola out of their problems,they are all adults they should settle their differences peacefully.His brother is not the first to marry from another tribe nd he won’t be the last. I am just tired of all these. Use your heads, people! Please dont say what you dont know. Even if Paul’s wife is Not Yoruba,that does not STOP Jude from hating Lola for being who and what she is….a fact has been established here which is that ;JUDE OKOYE HATES LOLA;HIS BROTHER’S WIFE SO PASSIONATELY! Do you get that. So your argument here is baseless and senseless…. Its better you go and advice JUDE OKOYE to stop hating instead of trying to defend his nefarious attitude ok.